in mainstream media excite you? who will be responsible for all media related tasks for the organisation. 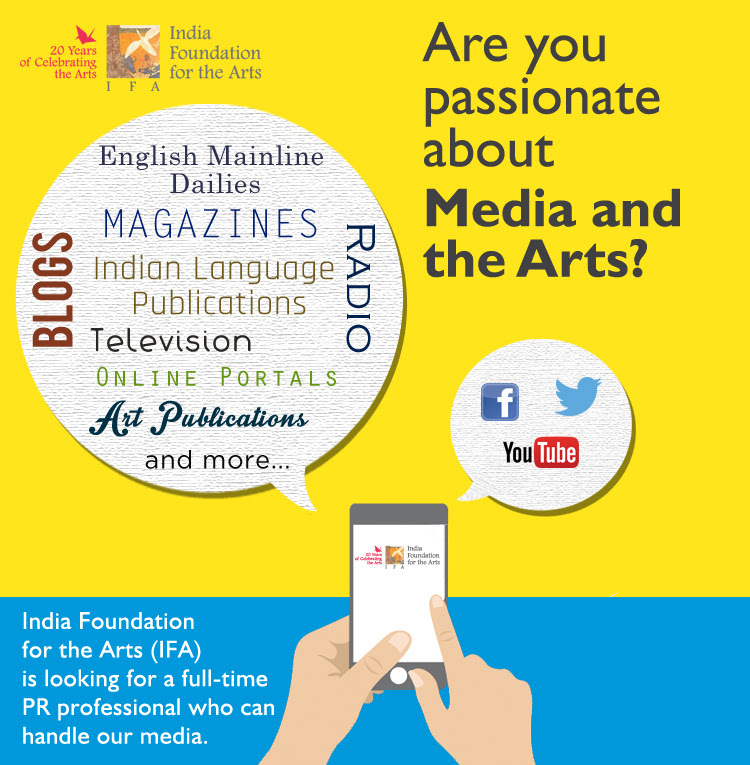 India Foundation for the Arts is an independent, national, not-for-profit, professionally managed grantmaking organisation based in Bangalore that supports research, practice and education in the arts across the country. Please visit www.indiaifa.org for further information on our mission, objectives and programmes. Applicants should ideally have an MBA/MA in Marketing/Communications/PR with a minimum of two years of experience in Public Relations, having worked with a Public Relations agency, a media house, the marketing communications department of a corporation, or the non-profit sector. REMUNERATION: Between Rs 4.5 lakh to Rs 5.5 lakh per annum, depending on the candidate’s skills and relevant years of work experience. Applicants should send a detailed CV, a cover letter stating their reasons for wanting to work with IFA, and a portfolio of their previous work across media. Preference will be given to people with prior work experience in the non-profit and/or the arts and culture sector. Send your complete application to contactus@indiaifa.org - any CV received without the above mentioned attachments will not be considered. The deadline for applications is July 08, 2015. Shortlisted candidates will be interviewed on the telephone and then in person, in Bangalore.